Eric had a full day so I called the shot for drinks! After picking him up from the conference we drove north to Quantum Brewing. I had the Final Gravity Russian imperial stout, Eric opted for the Project 142 Brown Ale. Our next stop was Ballast Point for dinner but as we had to wait for a table, so we queued up for our first beers at the bar. I went with the Pumpkin Down Scottish Ale (the Piper Down was out) and Eric had the quad (Belgian Dark Strong). Once at the table we ordered our meal and the next round: a Sour Wench Tart Cherry for Eric and the R&D Capirotada Stout (small pour) for me. Picked Eric up at 1pm and headed to Ocean Beach. Found a parking spot no problem and headed to Kilowatt Brewing. I had the Grand Entrance Export Stout and Eric had the S3 Tangerine Sour. We sat outside and people watched but enjoyed the blacklight artwork and games on the inside. Taking a quick beer break, we walked down to the pier and watched surfers for a bit (and parakeets) then headed to the laid-back Culture Brewing for an Imperial Stout (9.5% on nitro) and Yikes My Dude (8.8% imperial sour). After dinner with our college friend we drove a little further down the street to Hamilton’s Tavern for a beer each. Managed to pick the two on special! A biere de noel and pastry stout, both from Big Sky Brewing. I worked for most of the day while E was at the conference then I got a call at 4:30 to meet him and two product reps at Modern Times. Yay! I had the Grim Tusk (a salted imperial stout) while Eric tried a variety of sours, including one that kicked (enough for taste, but not a glass unfortunately). 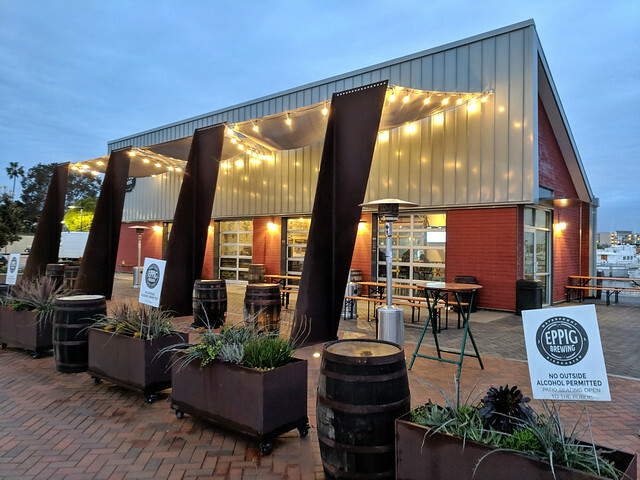 Eric had dinner plans with a group of work colleagues at 7pm so we headed down to Point Loma a bit early to visit Eppig Brewing’s Waterfront Biergarten. Parking was challenging as the lot right outside their building is only for the apartment complex and you will get towed if you park in the gigantic Point Loma Seafood lot. Managed to find street parking on Dickens Street. Rob was a friendly host and we tried a variety of beers: the Baltic Porter, Moment of Weakness (dark sour), Glitz and Glam (berliner weisse), and Comfy Chair (oatmeal stout). We hung out on the indoor benches until we needed to be at Stone Brewing for dinner. 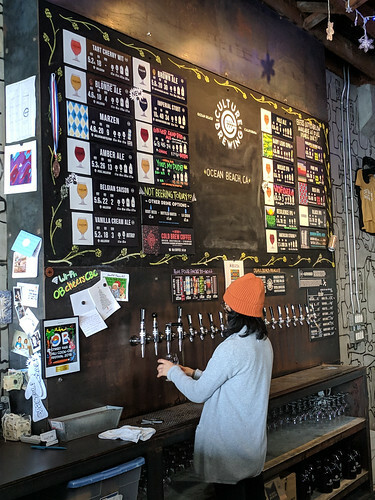 There I ordered the Midnight Sun Son of Berserker Stout (small pour) while Eric had small pours of the Stone Tartistry (PB&J berliner weisse), Port City Tripel, and an Upland Crimson (barrel-aged sour). Walked to Amplified Ales for happy hour. Started with the Hell Bent for Heather (Winter Warmer) and the Smokin’ Pumpkins. Got a great seat under a heater with views of the beach. We ordered the pita and hummus and our second round just before happy hour ended at 6pm, Rare Form Belgian Quad (13.9%) for Eric and BA Nyctophoba Russian Imp Stout (14.3%) for me. Everything was delicious as usual. It was blustery and rainy most of the day so we opted to drive to Draft for happy hour half-priced draft beers. I got the Barrel Harbor Confused Belgian to start and a High Water Campfire Stout. Eric got two pours of the now defunct Council Brewing’s Beatitude Tart Saison. We sat at the bar amidst several TV screens showing various basketball games. 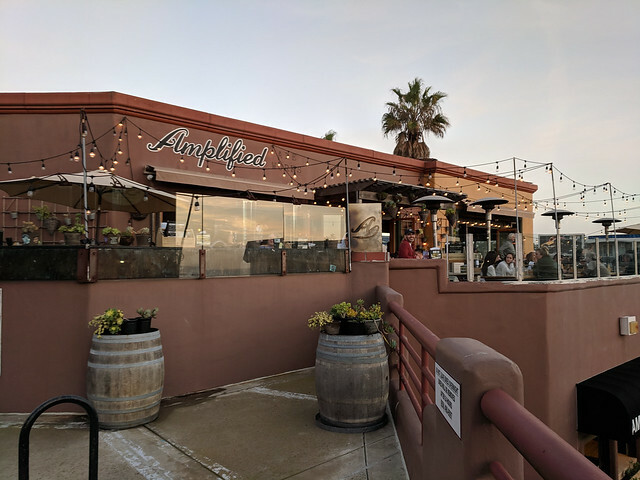 Headed to Amplified Ales again for happy hour, this time E got the two guest sours (Almanac Fruit Cobbler and Karl Strauss Queen of Tarts) and I had the Smokin’ Pumpkins and the BA Nychtophobia (yum!) We split the pita and hummus again which meant we weren’t really hungry for a proper sit-down dinner. Instead we went to Barrel Republic because the PB Ale House next door was slammed. 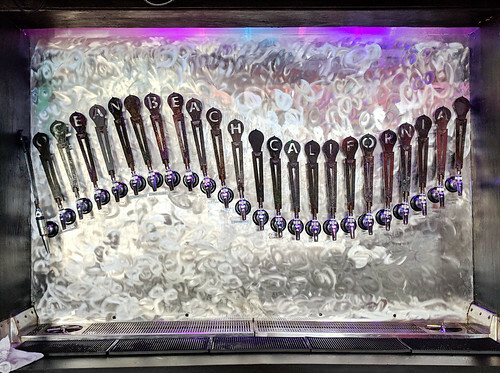 This place gives you a bracelet attached to a credit card so you can control the amount of each beer you get which meant we could try a number of options. After sharing a bottle of bubbles in our room with sunset, we walked to the PB TapRoom for dinner. A similar amount of taps to the place next door but we found the selection here more to our liking. I got the Speedway Stout from AleSmith and a Judgement Day by Lost Abbey and Eric ordered off the sour list, an SD Vice with Pink Guava from Wild Barrel Brewing and Ideal Sauvage from Green Flash.